G.O.M.S.No 186 dt.27.11.17 Encashment of Leave on Half Pay at the time of retirement of teaching and non-teaching staff of Aided Junior Colleges / Degree Colleges / Oriental Colleges and also for non-teaching staff working in PR, Municipality and Aided Schools – Orders – Issued. Several representations from the Employees’ Associations have been received to extend the reference to the teaching and non-teaching staff of Aided Junior Colleges / Degree Colleges / Oriental Colleges and also for non-teaching staff working in PR, Municipality and Aided Schools. 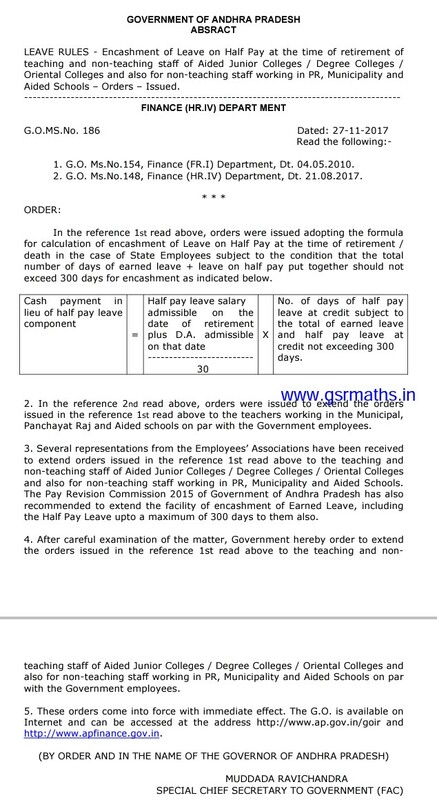 The Pay Revision Commission 2015 of Government of Andhra Pradesh has also recommended to extend the facility of encashment of Earned Leave, including the Half Pay Leave upto a maximum of 300 days to them also. After careful examination of the matter, Government hereby order to extend the orders issued in the reference 1st read above to the teaching and non teaching staff of Aided Junior Colleges / Degree Colleges / Oriental Colleges and also for non-teaching staff working in PR, Municipality and Aided Schools on par with the Government employees. These orders come into force with immediate effect.